Spring is right around the corner in Richmond, and the warmer weather will finally give you the chance to work on those outdoor projects you haven’t gotten to in the winter. 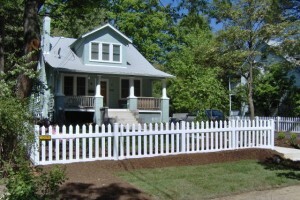 A good idea is to clean the fence in your yard and get it ready for the summer. Vinyl fences are great not only because they’re durable, but also because they’re easy to clean. All you need to clean a vinyl fence is a bucket of soapy water and a rag. Wash the fence with the rag and soapy water, and then rinse with the hose, and your vinyl fence should look as good as new. Cleaning wood fences is a little more involved than vinyl, but it’s still relatively easy. You can use either a mixture of one part bleach two parts water, or a wood cleaning solution. Make sure to wear gloves. Apply the solution you choose to the fence and let it eat away at grime and dirt. When you see the fence get brighter, wash it off with the hose, and let it air dry. To clean a chain link fence, use a soft bristled brush and a bucket of soapy water, brush, rinse, dry, and you’re finished! This entry was posted on Friday, March 14th, 2014 at 8:33 pm. Both comments and pings are currently closed.